I’m using Ubuntu Linux, I’ve used linux as my primary OS for a very long time, and am using Ubuntu through laziness on my part. The prayer time widget in the top left hand corner of the left screen is one I developed myself (kprayertime). Below it is a moon phase widget, you can see it was just after the middle of the lunar month when I wrote this (in the blessed month of Ramadan). You can also see a weather widget that tells me it’s raining a lot in Bristol – well, I already knew that. Various items belonging to my daughter and wife are scattered on the desk, every few days I have to ‘send’ things back to their owners, usually by throwing them onto the respective bed. The desk lamp was given to me by my friend Zubair. There’s an uber mouse mat with the map of the world, that is now up-side down. An IKEA clock and Aldi watch can be seen, together with some Kumon homework. 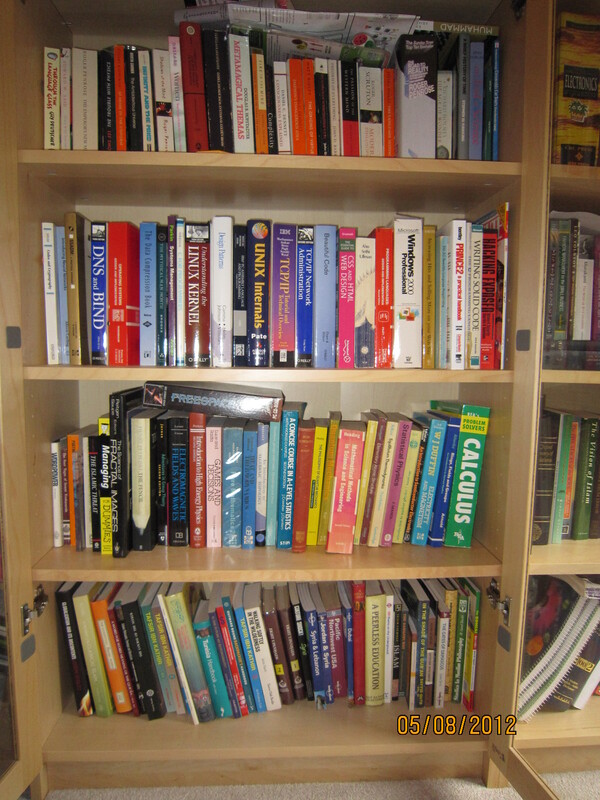 Here you can see my wife’s books, and others about science, the philosphy and history of science and other miscellanea. Notable books for me in terms of my personal development are “Godel, Escher and Bach” and “Complexity, Entropy and the Physics of Information”. 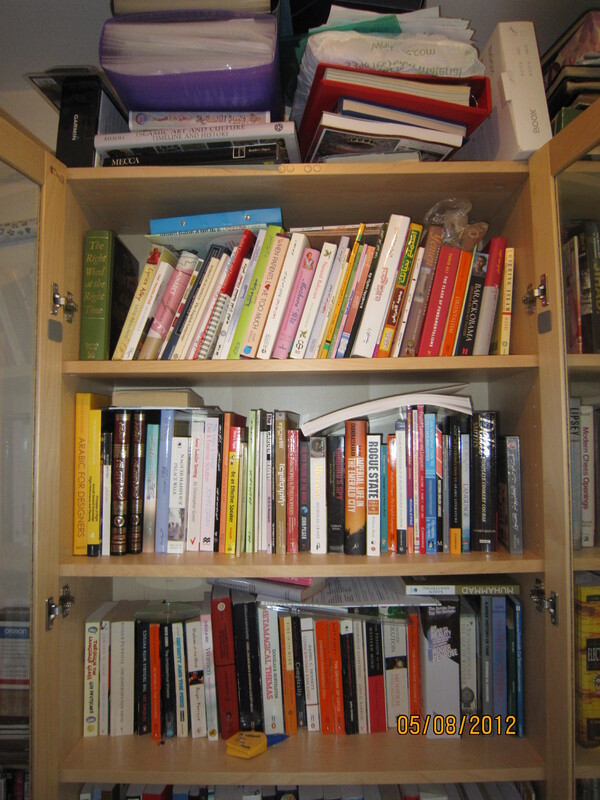 Here we have a distilled collection of IT books. 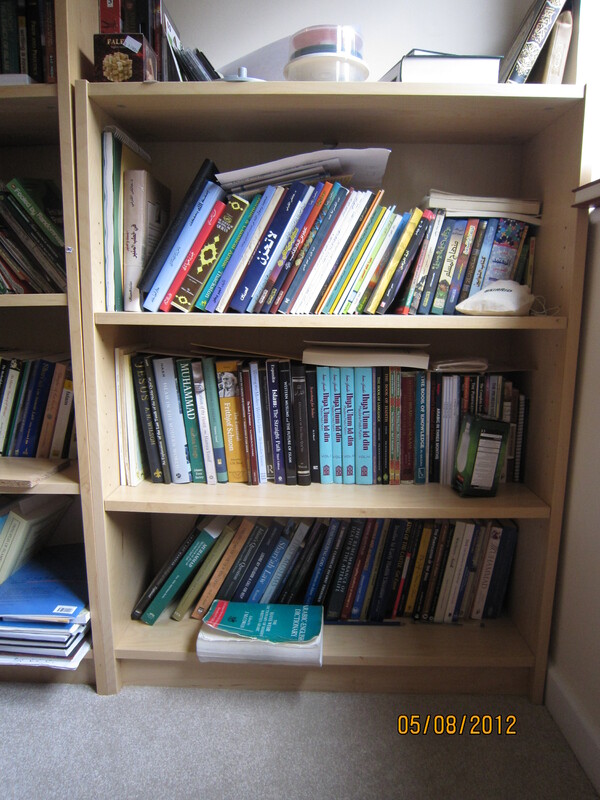 Such is the ephemeral nature of IT books that recently I gave/threw away two thousand pounds worth (well, spent) of IT text books due to lack of space in the flat. 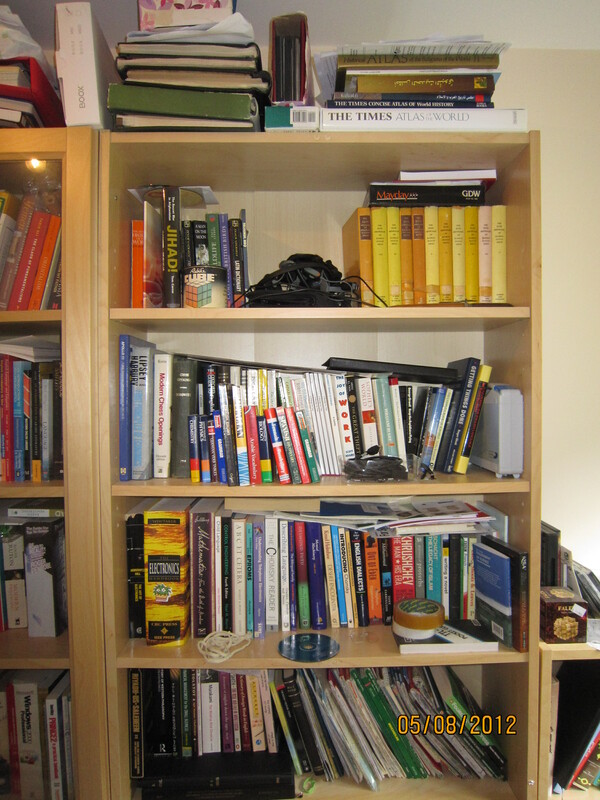 Below those is the books I studied during my physics degree, and some travel books below them. In the early 1990s I bought the book “The Science of Fractal Images” at Foyles in London. I spent many Saturday afternoons up and down Charing Cross Rd (also eating far too many pizzas at the Pizza Hut there) and bought my first islamic book at The Middle-Eastern Bookshop at the south end of the road. I think it was ‘The Book of Knowledge’, the first book in Imam alGhazali’s Ihyaa’. I also bought various books by Muhammad Asad including his translation of the Qur’aan. I think it’s fair to say that these books still have a great influence on me. Subhaan Allaah when I look back at my life there are definitely times when I was guided like an arrow to the straight path, in terms of knowledge and people. This bookcase largely contains miscellanea, including various books about language in general, which is an interest of mine. 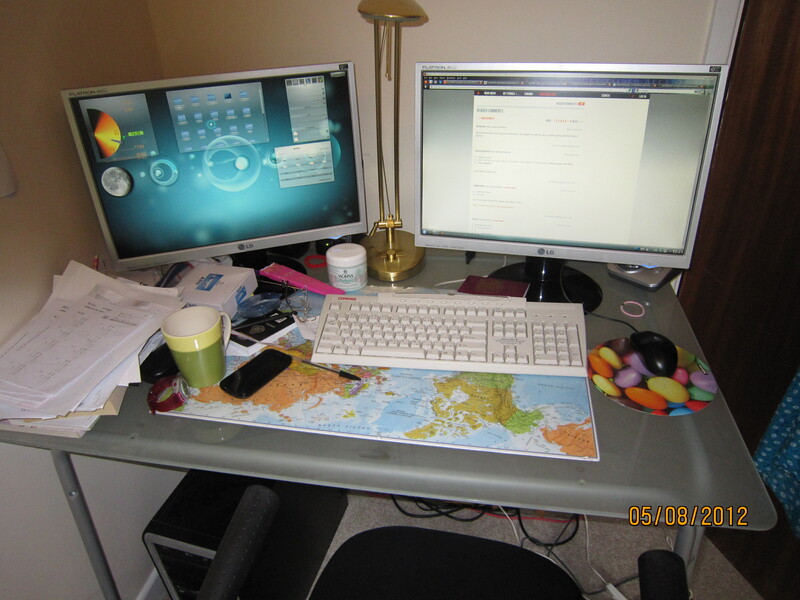 The maps are there because when I travel I like to keep the maps that I used, as a memento. 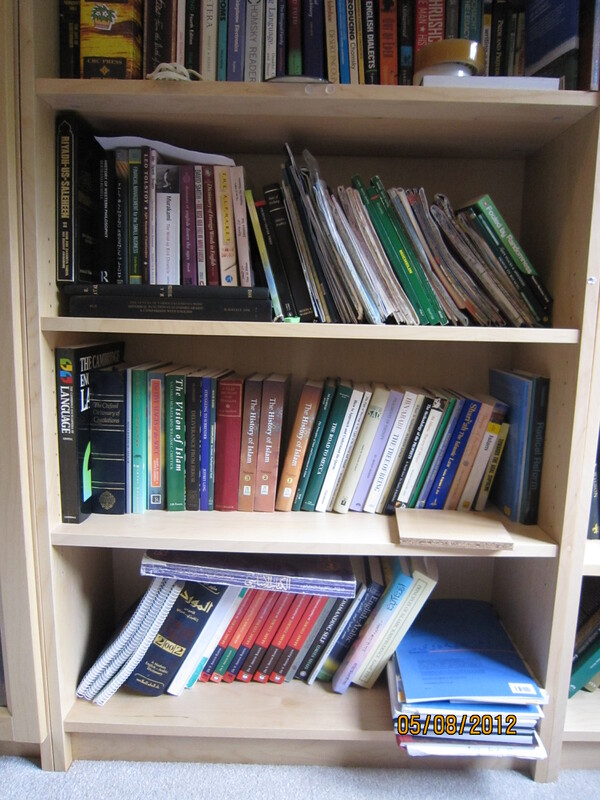 A number of the linguistics books are my wife’s, whose PhD thesis (in arabic-english linguistics) can also be seen. 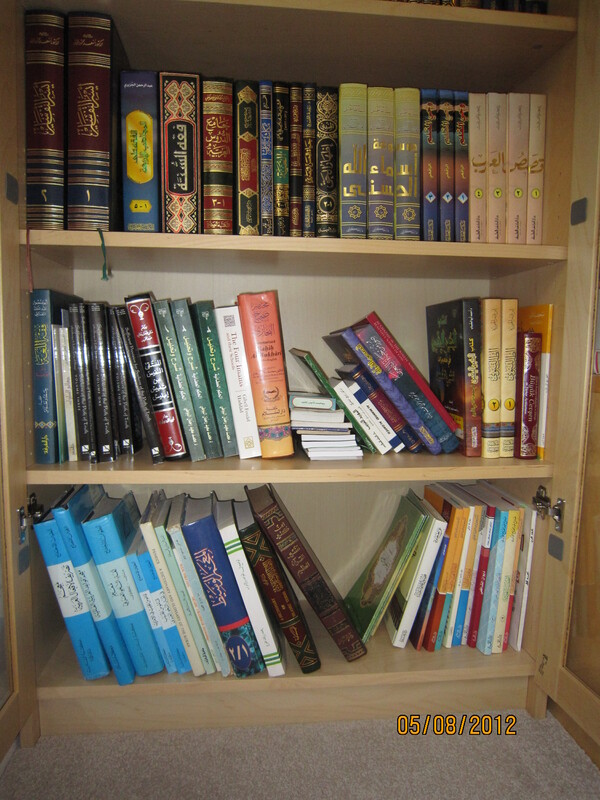 Here we have various islamic books and below them some arabic language learning resources. I now teach arabic to beginners and intermediate level, while continually trying to improve my own level of arabic too. We’re getting on to pride of place now, these books and those you can see below are on either side of me when I am doing my prayers, reading the Qur’aan or meditating on life, the universe and everything :-). There are numerous translations of Imam alGhazali, particularly from his Ihyaa’. A notable book is Searching For Solace, a biography of Yusuf Ali. A sad tale but which somehow sums up the state of the muslim world at the moment. Various books by Charles Le Gai Eaton, who I think writes beautifully about islam and explains it so well to the Western mind. Because he has some heterodox views he is not promoted by the muslims, which is a shame. We’ve reached some truly great books now. Bottom left in blue and white are some grammar and morphology books by Antoine Dahdah. I love those books. We then have various less technical books about iman and other important islamic topics. Above them we have Sharh wa Tahleel of alHikam al`Ataa`iyya by Dr Ramadan Buti (they’re up-side down too – how did they get like that!) which is an explanation of the great book by Ibn `Ataa’illaahi alIskandariyya. My wife chose many of these books when we came back from Syria. There are the five volumes of Sufficient For Seekers of the Path of Truth which is a fine translation of the great book AlGhunya. 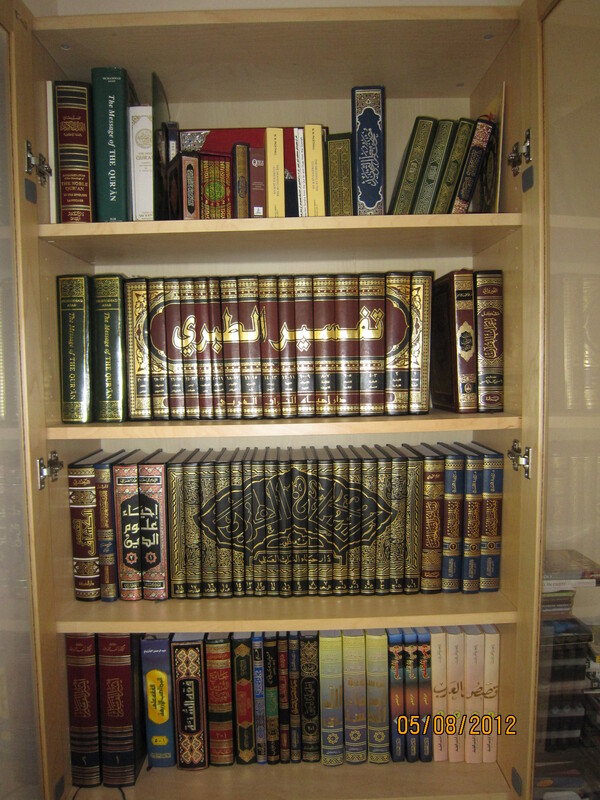 Pride of place, of course, goes to the masaahif (copies of the Qur’aan) and tafaaseer (explanations of the Qur’aan). For those who can’t read arabic the red and gold volumes are Tafseer utTabari, an explanation of the Qur’aan largely based on hadith narrated about the meaning of each ayat. The black and gold volumes are Lisaan al`Arab, a wonderful (and huge) dictionary of arabic. There are hundred of thousands of words, often accompanied by arabic poetry (or hadith or ayats) giving an example of the word in use. At the top, physically and metaphorically, are the masaahif, copies of the noble Qur’aan. Writing the above has made me realise why I cart some of these older books around, even though in a sense they represent a skin that has been shed. They are a part of my history and remind me of the times when I was reading them. They serve as a type of authentication that my islam is not based on an ignorance of the pinnacle of Western knowledge, but as an ascent from it to higher goals. If you enjoyed this post then please do something similar yourself and let me know! Brothers and sisters we have been born into a society very unlike the societies that our parents, grandparents and older generations were born into. Science has advanced far beyond what our grandparents could have envisioned and the combination of cheap and instant global communication together with cheap international travel has led to the development of a global monoculture. This monoculture is formed within the most powerful group of all, usually called by its blanket name the West. This monoculture brings with it a worldview which has the invisible attraction that draws those that would like to have power (or at least, not be weak) towards those that have power. However, to those that think, this worldview is unattractive. If fact it is often ugly. Even those who promote its views and ethics confess that they invented the ethics themselves. The intellectual cadre within them even promote the belief that those ethics ‘evolved’ for the material benefit of those holding the views. The intellectuals make no claim to have a real set of ethics that all should follow, although the governments send their armies out around the world with the excuse of correcting the morals of the owners of the resources the army are laying claim to. We are here today because, thank God, we have found and united on a divinely sourced worldview which we all recognise as being the straight path. How did we recognise this worldview of ours, Islam, as divine? Each of us has had our own path to that realisation, but for all of us a pillar (whether realised or not) of our belief is the miracle of the Qur’aan. The qur’aan was revealed to the prophet Muhammad (SAW) 1400 years ago over a period of 23 years. Its message was so powerful, beautiful and transforming that when the messenger Muhammad told his companions that it was delivered to him by the angel Gabriel, they had no doubt that he was telling the truth. The continued miracle of the revelation of the message of the Qur’aan and the wonderful character and uprightness of its prophet inspired his companions to propagate this divine message. This message was so evidently divine in origin, inspiring and beautiful that it was treasured and followed by the companions of the prophet, and then their subsequent generations. This amazing message spread across land and sea at astonishing speed to Morocco in the West and China in the East, and spread its light also through the ages across 1400 years. If we estimate 27 years as the average generation gap then this is over 50 generations. From the earliest days of the revelations it was recognised that the message must be preserved exactly as the angel Gabriel delivered it and to this day we have the written Qur’aan exactly as it was written then. The hearts of over a billion people have been illuminated by this divine message. This beautiful message said that Allah teaches by the pen what we do not know – and amazingly Allah is still teaching us with this message 1400 years later. 1400 years and 50 generations have passed, we live thousands of miles away from the place of revelation, societal structure has changed tremendously and yet every single verse of the 6200 verses in the Qur’aan still fully apply to and transform our lives. This is surely one of the greatest miracles of the Qur’aan. One of the beautiful facets of classical Arabic ( اللغة الفصحى) is how it carries the concepts expressed in the Qur’aan and how it helps the one who contemplates its meaning to approach what it is intended to say. This is the content of a khutba about سورة العصر (the chapter in the Qur’aan called surat al`ASr). With that in mind and with the encouragement of the Messenger of God Muhammad صلّى الله عليه و سلّم (peace and blessings be upon him) we should memorise what we can of the Qur’aan and try our best to understand it. The صحابة (companions of the prophet) used not to memorize further Qur’aan until they had put into action the last ten ayas that they had learnt. From that we can deduce that we should concentrate on memorising and understanding the short suras so as to make sure we are focusing on the most urgent elements of the message that Allah has sent to us. Today I am going to explain the meaning of a small sura to you and help you to focus on the key arabic words so that when you recite it in your prayers ( صلاة) you can be aware of and attend to its meaning. Brothers and sisters we often hear talk of the scientific miracles of the Qur’aan but I think we overlook much greater miracles than these. I’ve already mentioned how the Qur’aan has emanated its light across the entire globe and 50 generations of people. We overlook the amazing miracle that anything exists at all! How is the universe sustained from nano-second to nano-second, and from aeon to aeon. How is it that we, our exact persons, came into existence? Why were our souls picked to live on this Earth out of the infinite possibilities? Surely the natural state in the absence of God is nothingness. Because everyone takes these phenomena for granted we overlook how extraordinary they are. Time itself is amazing. Without time there would be no cause and effect. Without time the concept of knowing the past but not knowing the future would not exist. There would be no memories and no plans. The Qur’aan makes reference to the creation, the beginning of time, and the end of time. Also the creation of mankind on this Earth and yawm alqiyaama (يوم القيامة) the end of mankind on this Earth. Allah describes our own personal paths through time, from birth to death. Allah سبحانه و تعالى tells us that He is the not only the Creator (الخالق )but also the Beginning and the End (الأوّل و الأخر ). Time acts as a veil (حجاب, Hijaab) between ourselves and our destinies. We often look to the heavens as a veil between us and Allah, but what about the subatomic world and its subatomic nature? These all act as veils between us and the reality of Allah, الحقّ alHaqq. In this ayat Allah is swearing an oath as to the strength and verity of the message he is about to give us. He swears By Time, the message the follows is true and of utmost importance. So what is this message? There is a warning and also good news. Allah emphasises that in the absence of other actions man is at a loss. He is making a metaphor that on judgement day our good and bad deeds will be weighed up just as an accountant weighs up profit and loss. The key word to memorise here is khusr خُسْر meaning ‘loss’. Signs of Allah means here not just the verses of the Qur’aan but all those natural phenomena that we can witness and contemplate both in the universe around us and within ourselves. Allah commands us in the Qur’aan to think and to contemplate. صالحات good deeds. We should do good deeds for the sake of Allah alone. Remember, deeds are accounted for according to our intentions. The companions of the prophet SAW used to run out into the road if they thought someone needed help outside, solely to gain reward with Allah. حَقّ has multiple meanings, amongst them truth, reality and right (as in one’s rights). It is also one of the names of Allah.We have to mutually encourage each other to the truth, to giving each other his rights/due. How amazing is the affair of the believer. Everything is good for him – and that is for no one but the believer: If good times come his way he is thankful and that is good for him, and if hardship comes his way he is patient and that is good for him. We should also notice that as the ulema have pointed out to us, even the order of the words carries meaning. First we must believe, and then do good deeds with the good intention of the believer to act for Allah’s sake. We should uphold the truth and our brothers and sisters rights, and should have the patience to put up with the difficulties that standing against the flow and decay brings with it. So brothers and sisters for those of you who don’t already know it, I strongly encourage you to learn the meanings of these six words and to contemplate their meaning whenever you recite this sura in your Salat. There are many resources available for you to go and learn this in your own time over the course of the next week or so. When I became a muslim, and later with the birth of my daughter, I was presented with the problem: how do you transliterate عبد الحقّ and تقى ? As for my name عبد الحقّ I decided on Abdulhaq but other options were Abdalhaqq, AbdelHaque and combinations thereof. For my daughter my wife and I selected Tuqa. So what factors were involved in my decision? I chose not to put the doubled-q because it seemed confusing to non-arabic speakers. I chose Abdulhaq over Abdalhaq but we cannot say that one is more correct than the other. From the point of view of arabic grammar both an ‘a’ and a ‘u’ are possible for vowels on the d.
Arabic speakers will note that the initial letter `ayn is omitted in the transliteration. Traditionally the word `abd is transliterated as Abd when in a name, as non-arabic speakers cannot pronounce and usually do not even hear the `ayn anyway. For Tuqa there was less choice and the other alternative was to use a k instead of the more scholarly q. We chose q and we have found that her teachers, for instance, have no problem reading the name. By the way, humorously, when I travelled to Syria to get married (which was 4 years after becoming a muslim) my wife’s family asked her: Why did you choose a name for him that is so difficult to pronounce ! ?